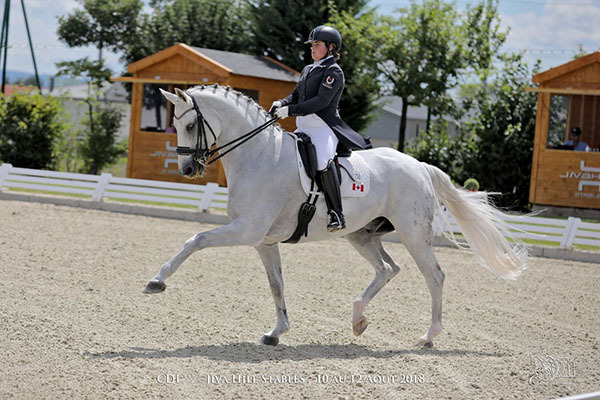 Equestrian Canada (EC) and the Brosda family are pleased to announce Tanya Strasser-Shostak of Saint-Adèle, QC, as the recipient of the $10,000 Brosda Olympic Bursary for 2019. Strasser-Shostak’s application to the 2019 Bursary was centred around making her major games debut at the 2020 Tokyo Olympic Games. Criteria for the Bursary included reporting on international performance results for the previous 12 months, yearly training and competition plans showing proper progress to the Olympic Games, a detailed plan on how the Bursary funds would be used to support development and progression to the Olympic Games, and much more. In addition to meticulous planning, Strasser-Shostak works diligently with several top coaches to reach her goal: her mother and Canadian Olympian, Evi Strasser; four-time Canadian Olympian, Ashley Holzer; and British Olympian and renowned athlete, Charlotte Dujardin. Strasser-Shostak has been an immense asset to Canadian dressage since the early stages of her career, winning multiple medals at the North American Youth Championships (formerly the North American Junior and Young Riders Championships) and earning the title of 2013 EC Junior Equestrian of the Year. When she transitioned to the Under 25 (U25) Grand Prix level in 2016, Strasser-Shostak was awarded the inaugural Orion Cup for her potential to successfully represent Canada on the world stage. In 2017, she helped Team Canada 2 earn a bronze team medal at the inaugural CDIO-U25 FEI Nations Cup in Wellington, FL. Strasser-Shostak pushed herself even further the next year with a return to the U25 Nations Cup Wellington, as well as an extended trip to Europe, where she competed at some of the most prestigious and challenging venues in the Eastern Hemisphere. As the successful candidate for 2019, Strasser-Shostak will be an ambassador for the Brosda Olympic Bursary, promoting the Olympic values of excellence, teamwork, leadership and fair play, and sharing her stories and experiences through public speaking engagements and on social media. On behalf of the Brosda family, EC is honoured to facilitate support for the Élisabeth Brosda Memorial Fund through the Horsepower Foundation - a fundraising program created by EC, in partnership with the Canadian Olympic Foundation, to inspire and support Canadians to embrace lifelong participation in equestrian activities. As a lasting legacy in memory of Élisabeth Brosda, funds donated to the Élisabeth Brosda Memorial Fund are directed specifically to the annual Brosda Olympic Bursary. Donations to the Élisabeth Brosda Memorial Fund can be made online or by cheque. Please make cheques out to the Canadian Olympic Foundation and include Élisabeth Brosda Memorial Fund in the memo area of the cheque. Cheques can be mailed to: Canadian Olympic Foundation, 21 St. Clair Ave. E., Suite 900, Toronto, ON Canada, M4T 1L9. Tax receipts can be provided for donations over $10. For more information on the Brosda Olympic Bursary, visit www.equestrian.ca/sport/dressage/athlete-development .